"Yes, You can Automate Your ENTIRE Income & Finally Start Generating Sales... TODAY"
Then, How to QUICKLY Scale Up Your Income To Whatever Level You Desire"
In step 1 you’ll discover how to set everything up quickly & easily with easy to follow step by step video tutorials. You also get all the tools and content free so there’s zero content creation required. In step 2, you’ll see how to setup your automated traffic streams in minutes. This is easy to do, brings in fast results and runs on complete auto-pilot, freeing up time to work on growing your income instead of maintaining it. Want more traffic and sales? No problem – you can easily scale up by adding more automated traffic streams in just minutes. Expect traffic and sales to grow each time you implement this. Whether you're just starting out or you're a season internet marketer, the no:1 problem we all have is getting traffic. Thankfully, this is no longer a problem when using the Evergreen Wealth Formula 2.0 system, as not only will this end your traffic worries forever, but you'll be able to scale up your traffic to whatever level you desire quickly and easily just by adding new automated traffic streams that only take minutes each time to implement. However, getting traffic is only part of the equation, as you also need to convert it into sales - and to do that - you need high quality content that converts your traffic into sales. Thankfully, the Evergreen Wealth Formula 2.0 system takes care of all this for you as you'll get all the content you need to whip your traffic into a instant buying frenzy and purchase whatever you're offering without hesitation. Also, you're not "chained and balled" to promote any one offer - you can use the Evergreen Wealth Formula 2.0 to sell any affiliate offer from any affiliate network, or your own products and services if you have any. Your very own fully functioning website designed to convert visitors into easy sales. Your own range of ready made, high priced products and how to sell them in a completely automated manner. All the selling material optimised for high conversions to convert the most reluctant prospects into happy buyers. An unlimited supply of high quality articles for every conceivable market and niche out there, so you won't have to write a single word ever again. All the graphics created and hosted for you. A complete series of pre-written swipes with proven open rates and CTRs. All the content and websites can be used "as is" or edited to your particular liking... It's entirely up to you. And of course... How to set all of the above so it runs on complete automation. I'll be honest with you, the Evergreen Wealth Formula 2.0 is a big course. However, you'll have no problem setting up and profiting from this system. Why? Because even though the Evergreen Wealth Formula 2.0 is a complete A - Z money making system for advanced marketers... I've designed it for the beginner in mind. You'll be taken from start to finish with easy to follow step by step video tutorials that anyone - regardless of experience - can implement and profit from. Even though I've made the the Evergreen Wealth Formula 2.0 as easy to implement and get results from, I want you to know I've totally got your back. 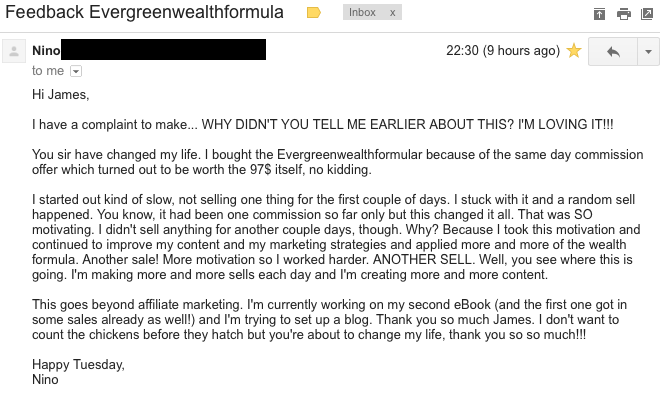 This is because, when you order the Evergreen Wealth Formula 2.0, you also get free "one on one" email support with me personally (James Scholes, the creator) for life. So if you run into any problems - no matter how big or small - hit me up and I'll get back to you and personally help you through your sticking point so you can get results faster without ever struggling on your own. To guarantee you get fast results, you'll also get access to the "Fast Traffic Methods" module you can use in conjunction with the Evergreen Wealth Formula 2.0 to generate you sales as soon as today. These are proven methods that will deliver massive amounts of traffic on the same day as implementing them, so you can start making money with the Evergreen Wealth Formula 2.0 the same day you implement these powerful methods. "Everyone of these testimonials are from actual Evergreen Wealth Formula members who paid full price for admission and each one can be verified via Paypal invoices"
"I made my first affiliate sale"
"That's the most I've ever made"
"I have made my first sale"
"I have made 3 more sales this morning"
"I have made my 9th Sale"
"I have made my 10th Sale on the EWF2.0"
"I had my first 100 dollar day!" "Can’t believe the value & time you’ve put into this"
"I have a complaint to make..."
How to make a full time, automated income online from home with ease. How to quickly and easily scale up your income to whatever level you desire. Never worry about creating a single piece of content as all the content you will ever need comes free with the Evergreen Wealth Formula 2.0 system. Get access to easy to follow "step by step" video tutorials anyone - regardless of experience - can implement and get results from. Get free "one on one" email support with James Scholes, the creator of the Evergreen Wealth Formula system, for life. Get all the latest updates and new modules as and when they added absolutely free for life. Once payment is made – Your login details will be mailed to your email address connected to your Paypal account. From there, you will be able to login and start implementing the Evergreen Wealth Formula 2.0 system instantly. What is the computer requirements for the Evergreen Wealth Formula 2.0? You will be able to login and view all the training with any computer or smart device. However, you will need a Windows enabled desktop or laptop to get the most out of this course. If you’re a Mac user, you can download a fully functioning copy of Windows for free from Microsoft’s own website and use Bootcamp to install it or use a VPN if you don’t want to install Windows on your Mac. Does the Evergreen Wealth Formula 2.0 work worldwide, and if not, which countries will it not work in? Providing you’ve got a computer and a internet connection, the Evergreen Wealth Formula 2.0 system will work anywhere in the world, so you’ve got nothing to worry about on that front. Is the Evergreen Wealth Formula 2.0 updated regularly? Yes, the Evergreen Wealth Formula is constantly updated with the latest methods and revisions. Plus, every Evergreen Wealth Formula 2.0 member will get all updates and new modules as and when they’re added free for life too. Do the “Automated Traffic Streams” you setup within the Evergreen Wealth Formula 2.0 deliver quality traffic? Yes, the Automated Traffic Streams deliver extremely high quality human traffic who want to invest their hard-earned money in whatever you’re selling. In fact, this is all I do to drive traffic these days and it converts really well for me and others who use it too. Will I have to sell to people on social media websites like Facebook etc? Don’t worry – you won’t have to pester friends, family or strangers to invest in programs or services on Facebook. Like I said, the Evergreen Wealth Formula 2.0 is completely automated. The only work involved is setting up and adding more Automated Traffic Streams to grow your income. Once you’ve hit your desired income level, the Evergreen Wealth Formula 2.0 will run completely automated, therefore freeing up your time to do whatever you wish. Is there a cost to implementing the traffic in the Evergreen Wealth Formula 2.0? 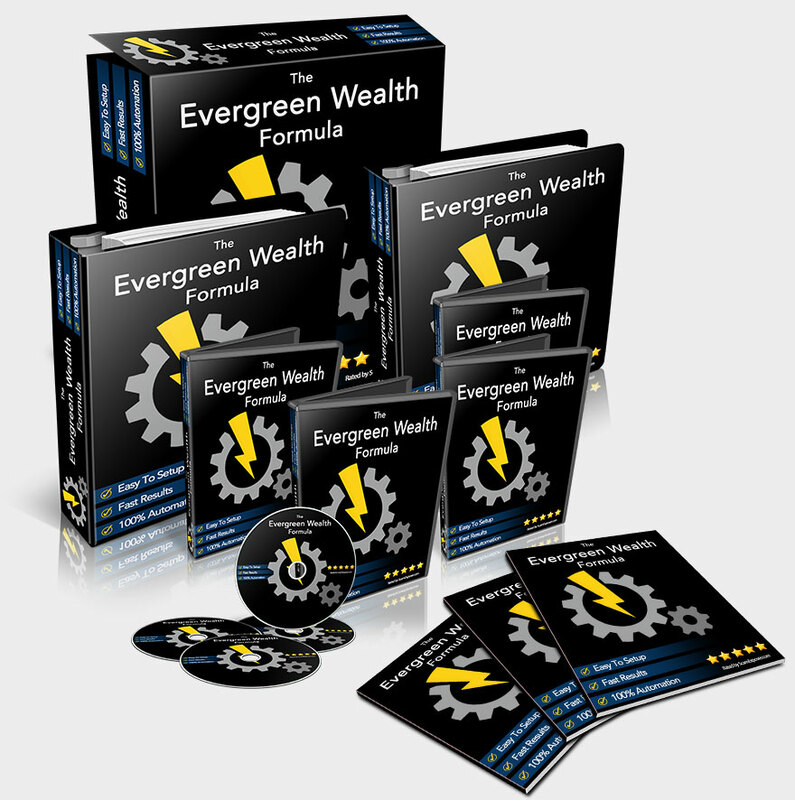 The Evergreen Wealth Formula 2.0 teaches BOTH free and paid traffic methods. So if you’re on a tight budget, you can start with the free traffic methods if you want to. That said, the paid traffic method is only $20 a month and you can scale this up to whatever level you desire, so it’s extremely cheap to implement anyway. Which markets can I use the Evergreen Wealth Formula 2.0 for? Although you get all the content you need to dominate one market, the Evergreen Wealth Formula 2.0 can be used in absolutely any market you want to enter. So whether you want to enter the weight loss, seduction, dog training etc, the Evergreen Wealth Formula 2.0 methods can be used for those markets with no problems whatsoever. I have a question but it's not listed here? You can contact me personally (James Scholes, the creator of the Evergreen Wealth Formula 2.0) here, and I’ll be more than happy to answer any questions you have.